Wealthy benefactors like John Jacob Astor, Cornelius and George Vanderbilt, Edwin Booth, Levi Morton and Pierre Lorillard quickly purchased life memberships, creating a financial foundation. 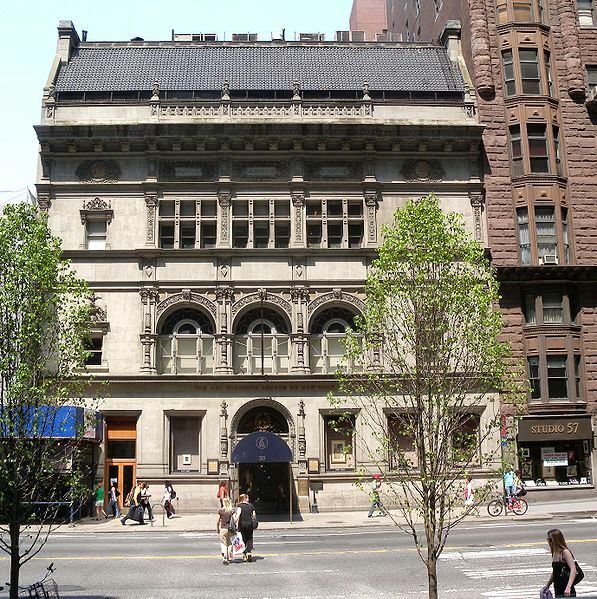 On October 3 the trustees met – including esteemed names such as Henry Hardenbergh, Louis Tiffany and Daniel French --to discuss interest in a site on 43rd Street for their new building, which they anticipated would cost about $210,000 including the land. 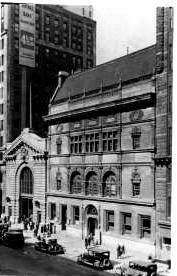 The plans for the 43rd Street site fell through, but by December of 1890 the Society had purchased for $154,000 the plot of land on 57th Street, running through to 58th Street, next to the new Osborne Apartments and diagonally across from Carnegie Hall, still being constructed. A competition among 38 architects resulted in the commission going to the Society’s Secretary, Henry Hardenberg and his partners, William C. Hunting and John C. Jacobsen. The building was completed in 1892. Hardenbergh adapted its design from the 16th Century hunting lodge of King Francis I in the forest of Fontainebleau. The architect gave the impression of the 3-story structure by lighting the fourth floor with skylights and no windows. White marble, ornate terra cotta and buff brick combined to produce a rich and stately façade. On December 30th at the Architectural League’s dinner, George W. Vanderbilt presented the Society with a gift of $100,000 to pay off the outstanding debt on the building. On May 3, 1901, fire erupted on the fourth floor just as men and women in evening wear alighted from their carriages to attend the fancy dress ball of the Society of American Fakirs. Paints, oils, turpentine and students’ tools had all been heaped together in a corner, according to fire fighters. The conflagration bent iron beams and small explosions caused one wall to collapse. When word of the fire reached the Salmagundi Club, panic set in. Many of the artists had valuable works of art on exhibition. Rumors raged that everything inside the building had been destroyed and club members rushed to the scene. In the Vanderbilt Gallery alone, paintings on exhibition were valued at $400,000. Amazingly, the fire was extinguished and no artworks were damaged either by fire or water. Over time the building became the sole property of The Art Students League. 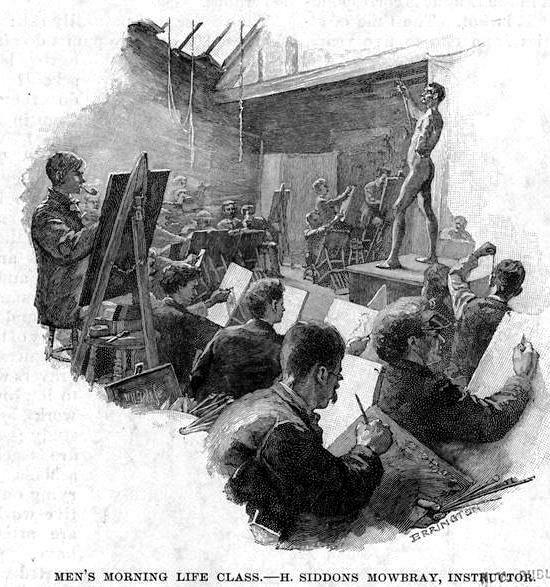 What had started out as a small group intent on teaching art was now one of the foremost fine art schools in the world. Early instructors included William Merritt Chase, Augustus Saint-Gaudens, Daniel Chester French, Thomas Eakins, and Childe Hassam. Norman Rockwell fondly recalled his days as a student here in his autobiography. Later in the century ground-breaking artists such as Louis Nevelson, Roy Lichtenstein and Mark Rothko either taught or lectured here. Enjoying your posts as always. Reading about the Art Students League today brought back many memories. I started attending the Saturday drawing classes when I was in high school, continued to attend the League during the summers while I was in college and then took night classes after I started working a 9-5 day job. Had wonderful instructors and learned a lot in that rarified atmosphere. What always impressed me was that in the class there would be beginners, barely able to draw the figure and very accomplished artists working right alongside them. Watching other students work as well as the instructors demonstrations was, for me, the best way to learn. One month, as I was on line to register for class, Richie Havens was on line in front of me registering as well. Lots of actors attended the League over the years too, such as Peter Falk. I continued attending until 1975 when my instructor at the time looked at my painting on the easel and said that there was nothing more he could teach me. I guess it was time to strike out on my own and around that time I'd also gotten a 35 mm camera and started to work from my photographs, which I continue to do to this day. The Art Students League is a wonderful place, thanks for the posting.